12TH ANNIVERSARY Concerts May 17-19! Performances | March 16, 2018 | by Missy Pfohl Smith. Celebrate BIODANCE’s 12th Anniversary at Geva Theatre Center’s Fielding Stage on May 17-20, 2018. TICKETS on sale now for BIODANCE friends! Follow this link for the best prices and seats for the BIODANCE 12th Anniversary Season at Geva Theatre Center’s Fielding Stage May 17-19, 2018! BIODANCE celebrates with highlights from its dozen years as a Rochester community-based company. Repertory will include a BIODANCE premiere by Missy Pfohl Smith with motion capture imaging by W. Michelle Harris and music composed by Garret Reynolds, a reprise of excerpts of “Solo/Countersolo” by NYC-based choreographer Heidi Latsky, “Possible Side Effects” by local choreographer and BIODANCER Jeanne Schickler Compisi, and other favorites from the company’s repertory. Rochester, NY- BIODANCEcelebrates its 12th anniversary in four concerts at Geva Theatre Center’s Fielding Stage on May 17-19, featuring a world premiere, two Rochester premieres, and selected repertory from the company’s dozen years of work, including the revival of Heidi Latsky’s Solo Countersolo. Former BIODANCE member Courtney World will return to her hometown of Rochester to perform for this anniversary celebration. BIODANCE is excited to revive Solo Countersolo, a masterwork created by internationally renowned artist Heidi Latsky in 2013 for her NYC-based company. Solo Countersolofocuses on a soloist (Missy Pfohl Smith) as the counterpoint to the ensemble, weaving through a landscape of vigorously moving bodies to British composer Chris Brierley’s passionate score. BIODANCE will premiere of Loom, a collaboration between choreographer Missy Pfohl Smith (Artistic Director, BIODANCE and Director, Program of Dance and Movement, University of Rochester), digital media artist W. Michelle Harris (Associate Professor, RIT), a long-time BIODANCE collaborator, and composer and Garret Reynolds (MM, Eastman).This visually striking work utilizes motion capture technology and features new live music. The program will also include works from its repertoire includingI.T. (2009) with live and original music by composer Mark Oliveri, and No Dancing Allowed (2011), both choreographed by Smith and Possible Side Effects(2016) choreographed by Jeanne Schickler Compisi. For this special occasion, BIODANCE also commissionedThat’s all, folks, a moving work by emerging Maine-based choreographers Flannery Black-Ingersoll and Johanna Hayes that will celebrate its Rochester premiere. This event ismade possible with support from the Decentralization Program, a regrant program of the New York State Council on the Arts with the support of Governor Andrew Cuomo and the New York State Legislature and administered by the Genesee Valley Council on the Arts at the Livingston Arts Center, a member supported organization. This event is also being generously supported by The Max and Marion Farash Charitable Foundation. BIODANCE 12thAnniversaryappears at Geva Theatre Center’s Fielding Nextstage May 17, 18, and 19 at 7:00pm and May 19 at 2pm. NOTE TO MEDIA: Interviews and photos are available upon request. Choreographer, performer and collaborative artist, Missy Pfohl Smithdirects the Program of Dance and Movement at University of Rochester and is artistic director for the contemporary repertory company, BIODANCE, based in Rochester, NY. Her work has continually sold out shows at Rochester Fringe, having been called “Gorgeous…astonishing…exceptional” and “a brilliantly crafted world of beauty, melody and calmness” by Rochester City News. She enjoys creating site specific work and recently created her second evening length show crafted for a 4 story planetarium in collaboration with a media artist, dancers, musicians and a visual artist. Missy’s viola and dance work with Bridget Kinneary is expanding to include new contemporary compositions by internationally known composers. Her choreography, performance and teaching has spanned across the US and internationally, most recently in Greece, Finland and Scotland. She is certified in Bill Evans Laban/Bartenieff-based pedagogy and also teaches choreography, dance on camera and contemporary dance and social justice. Before returning to Rochester in 2004, Smith was based in NYC for 12 years and performed and taught internationally with Randy James Dance Works and Paul Mosley, as well as apprenticing for the Erick Hawkins Dance Company. BIODANCEis a non-profit contemporary dance company founded in 2002 that collaborates with multi-disciplinary artists and is the only true repertory company in Rochester, performing work by a roster of recognized choreographers including Missy Pfohl Smith, Bill Evans, Randy James, Ivy Baldwin, Jeanne Schickler Compisi, D. Chase Angier, Laura Regna and Courtney World. BIODANCE explores social, political and environmental issues through its works always through dance, sometimes with text, film, music, and ice cream. 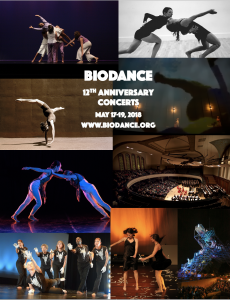 BIODANCE interacts with and outreaches to its community members and across the country in a variety of ways through performances, workshops, benefit concerts, interactive lecture-demonstrations and classes at venues such as Geva’s Nextstage, Hochstein Concert Hall, the Strasenburgh Planetarium, MUCCC and more. Over the past eight years, BIODANCE has been providing free dance and movement workshops to the Senior Center at Community Place of Greater Rochester. Recent collaborators have included the musical artists of Sound ExChange, digital media artist W. Michelle Harris, visual artist Allen C. Topolski, and the leading choral/orchestral ensemble Rochester Oratorio Society. BIODANCE has received Community Arts Organization Grants from the Arts and Cultural Council for Greater Rochester, New York State Council on the Arts and the NYS Legislature, from the Rochester Area Community Foundation, the Max and Marian Farash Charitable Foundation, among other grants to create new work, to interact with its community and to produce various annual home performance seasons. City News chose BIODANCE two years in a row for a Best of Fringe Award in the First Niagara Rochester Fringe Festival. Michelle Harrisis a media artist and a professor at Rochester Institute of Technology. Her work mixes digital and material to engage the audience while addressing the roles of women in American culture. Her work (solo and collaborative) has been shown at such diverse venues as the ACM SIGGRAPH, World Maker Faire, and the reActor International Conference on Digital Live Art, as well as regional venues such as the Baobab Cultural Center, Community Folk Art Center, Schwienfurth Memorial, and Four Walls. She has done visuals for performances in collaboration with choreographer Juanita Suarez (ImageMovementSound festivals and the Be Here Now ensemble), Sound ExChange orchestra, and BIODANCE (Rochester Fringe ‘17, ’16, ’15, ’13 Festivals). She received her BS in Computer Engineering from Carnegie Mellon University, and a MPS in Interactive Telecommunications from New York University’s Tisch School of the Arts (where she had the honor of interning with Troika Ranch). Michelle has been an ongoing collaborator with Missy Pfohl Smith at University of Rochester and BIODANCE, and plans to continue to collaborate with the company in 2018. Heidi Latsky, originally from Montreal, first received recognition as a celebrated principal dancer for the Bill T. Jones/Arnie Zane Dance Company (1987-1993). Her experience there profoundly influenced her style and her philosophy of dance as she developed a reputation in her own right as a choreographer for stage, theater and film. In 1993, she received a commission from the Cannes International Dance Festival. Three years later, she was chosen to represent Canada at the Suzanne Dellal International Dance Competition in Tel Aviv and at Danse a Lille in France. Since then, Latsky has toured extensively throughout the United States and Europe with her own company and as part of Goldhuber & Latsky(with former partner Lawrence Goldhuber) [1996-2000]. Latsky headed the Movement Department at The School for Film and Television from 1998-2005, where she developed her teaching practice: The Latsky Method. She has taught internationally throughout her career and her “Movement Portraits in Action” program has been implemented at the AIDS Service Center and The Creative Center in NYC. While working with Theater Director Mary Fulham, she received two Innovative Theater Award nominations. She served as choreographer on Academy Award nominated Katja Esson’s film “A Season of Madness” and as director and choreographer on Susan Murphy’s GIRL/GROUP at the Marquee, NYC (2003). In 2001, she founded her own company, Heidi Latsky Dance (HLD). During the fall of 2006, Latsky began an intensive period of creation with bi-lateral amputee, Lisa Bufano. This marked a significant shift of focus for HLD and a period of immense growth, during which she more fully developed the company’s mission and vision. HLD received an ARC grant through Pentacle that included mentoring Latsky for a period of 18 months, and in 2009 she was chosen by Creative Capital Foundation as one of four choreographers nationally to receive a three-year award for her evening-length work, GIMP. Her range of work is as varied as guest lecturing at Harvard University, performing with other Bill T Jones’ alumni in “SUMMER REUNION,” restaging a piece of Arnie Zane’s at the University of Wisconsin/Milwaukee, creating a work at the Aaron Academy for high school students with learning disabilities, directing workshops in performance skills, performing in 2012’s TEDxWomen, and developing new works for her contemporaries like Li Chiao Ping as featured in several films by Douglas Rosenberg, including Seven Solos in 2012. Latsky has continued her work as an adjudicator of the American College Dance Festival Association’s (ACDFA) and serves on the Artist Advisory Board of Danspace Project. She has a BA in Psychology with Honors from Carleton University (1979), receiving the Senate Medal for Outstanding Academic Achievement and The Ottawa Ladies College Scholarship. 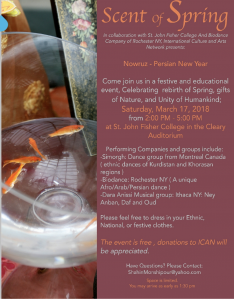 On March 17, 2018, BIODANCE tries something new as we learn about new cultures and fascinating places in the world. 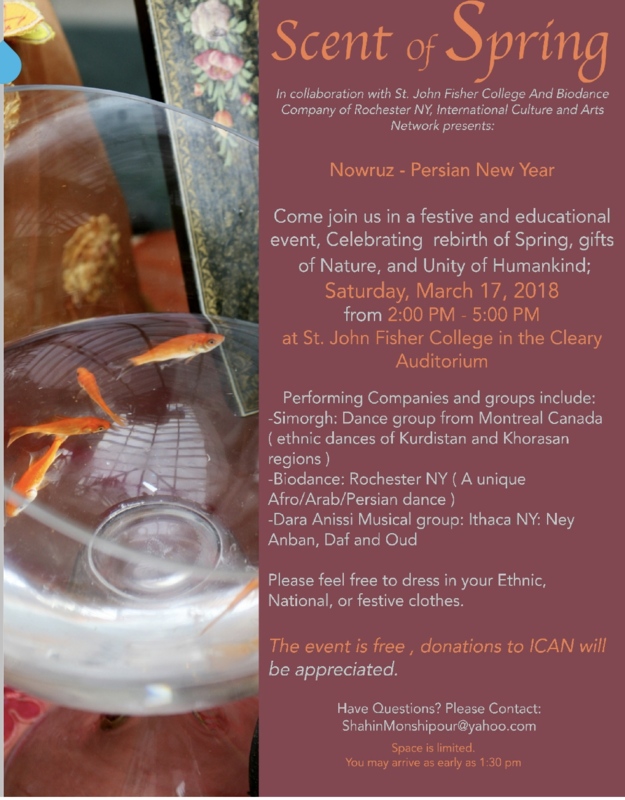 We will premiere a new collaborative work with Shahin Monshipour as part of InterCulture and Arts Network’s Celebration of the Persian New Year/Nowruz at St. John Fisher College at 2-5PM. The event is free and takes place in the Cleary Auditorium. Come celebrate the rebirth of spring, gifts of nature, and unity of humankind.